Published: March 7, 2017 at 12:40 p.m. Updated: March 7, 2017 at 12:47 p.m.
You feel that? That feeling of the sun peeking through the clouds, trying to knock the last bit of winter's chill from the air. The sense that life is being renewed and that hope once again springs eternal. That's right, it's #DraftSzn. Hyperbole? Maybe. But how else would we survive the seven weeks between the combine and the draft if not with breathless player comparisons and hysterical evaluations? Now that the talent evaluators have shut things down in Indianapolis for another year, it's time to start shuffling players up and down our way-too-early fantasy draft boards based on the results of a loosely-connected, semi-football-relevant athletic gauntlet. Fun! Can we start the draft now? In a quarterback class lacking a consensus top option, Watson did a lot this week to vault toward the top of the list. Crush the combine interviews? Check. Show well in the athletic testing? Check. Impress in the throwing portion of the proceedings? Check and mate. Watson is far from a perfect prospect, but he's a strong candidate to be a Week 1 starter somewhere in the league. That will give him strong value in dynasty rookie drafts and make him a worthy flier in plenty of redraft. If you know nothing else about what happened at the combine last weekend, you certainly know that John Ross blew the doors off of Lucas Oil Stadium setting an event record with a 4.22 time in the 40-yard dash. It was the only thing he did at the combine. What else did you want? If you want to see more, watch the tape. Cook turned out to be one of the bigger disappointments of the weekend. The all-around skills that Cook displayed on tape in Tallahassee didn't translate into great athletic scores in Indy. Expect the scouts to go back to the tape to get a better evaluation, but Cook's lackluster day will undoubtedly cost him spots in the draft. It's potentially bad news for Cook's bank account but could work in fantasy managers' favor if the talented back lands in a more competent offense. Fournette's time in Indy got off to a shaky start when his surprising weigh-in (240 pounds) and poor vertical jump (28.5 inches) sent parts of Twitter into a frenzy. That frenzy died down when Fournette did his best impersonation of a freight train and blazed through a 4.51-second 40-yard dash. Because he didn't do the rest of the drills, we'll be waiting for LSU's Pro Day to get Fournette's full athletic measure. In the meantime, he still has the making of a workhorse back who will get plenty of love from fantasy enthusiasts this summer. McCaffrey was one of the biggest stars at the combine, finishing among the top performers in nearly every category. While there will continue to be debate over what his role will be in the NFL and what type of offense will suit him best, he quieted any potential concerns about his athleticism. McCaffrey also reaffirmed to the fantasy masses that his hybrid ability will make him PPR gold, which shouldn't be surprising for the son of a wide receiver. Like the rest of the quarterbacks in this class, Kizer entered the week with plenty to prove. And ... well, he proved that he still has more to prove. Issues with footwork and missed passed during the throwing portion left plenty of scouts consternated. It wasn't all bad for Kizer. San Francisco 49ers general manager John Lynch was effusive when talking about Kizer's interview with the team. Unless he has a big pro day, it's tough to see Kizer as the top quarterback taken. Where his fantasy draft value lies will rely heavily on how much of a chance he has to be a starter early in his career. There might not be another quarterback who spawns such a wide range of opinions as Mahomes. His unconventional footwork and unorthodox arm angles are reminiscent of a shortstop playing quarterback -- fitting for a player with Mahomes' baseball background. Mechanics notwithstanding, Mahomes used the opportunity in Indianpolis to show off both his athleticism and his strong arm. Both are likely to cause scouts to take a chance on him. Mahomes' big arm and propensity to take chances in the passing game could make him a fantasy darling. You will just need to live with a few ugly interceptions. Whether he gets an opportunity to display that as a starter in 2017 remains to be seen. This year's tight end class is incredibly deep and Howard likely solidified his status at the top of the group with his combine work this week. Coming on the heels of a standout week at the Senior Bowl, Howard tested ahead of most of his tight end peers in just about every combine drill. As a blocker, Howard leaves something to be desired but he makes up for it with his ability as an offensive playmaker. With David Njoku not having the greatest combine workout, Howard might have locked up the spot as the top tight end in this draft. In the right offense, the Alabama product could continue the fantady rookie tight end production trend started by Hunter Henry last season. If you didn't know about Chris Godwin during the college regular season, you learned his name during this past January's Rose Bowl. If that wasn't enough, Godwin surprised plenty of observers in Indy with his combine workout -- notably the 4.42 40 time and 19 bench press reps. He's currently projected to be selected sometime late on Day 2 of the draft but he's putting together a draft portfolio that could give him deep fantasy sleeper appeal later this summer. After being one of the darlings of the Senior Bowl, the thought was that Kupp didn't have to run fast at the combine. But he couldn't run slow, either. Turns out ... he was kinda slow. Overall, it wasn't the greatest workout encore for Kupp. It won't stop him from being drafted by an NFL team, but the shine that was on Kupp coming out of Mobile has faded significantly. Will he turn out to be the big slot receiver that many have pegged him as? If so, his fantasy redraft value might be all but gone. Trubisky started his week in Indy by being put through the Twitter wringer over his request to be called "Mitchell". Once that subsided, the Tar Heel quarterback acquitted himself fairly well throwing the football. Maybe the bigger news was that Trubisky measured at 6-foot-2. It's not as tall as he was listed on North Carolina's roster but taller than he measured at the Senior Bowl when Draft Twitter had a mild freakout. The week went well enough for Trubisky that there were reports that the Browns are seriously considering him at No. 1 overall. A chance to be a Week 1 starter would certainly make fantasy managers pay attention, but Trubisky seems to be a couple of seasons away from true fantasy relevance. There are two kinds of people in this world -- those who love Kamara's NFL potential and those who don't get the hype. Count me among the latter group. Even still, I can recognize a player who had a great combine workout and Kamara certainly killed it. His SPARQ score ranked tops among running backs at the combine leading some to speculate that Kamara could creep into the first round of the NFL Draft. After spending the past couple of seasons as a third-down back with limited usage rates in the Volunteers offense, it seems hard to imagine him suddenly becoming a big time NFL (or fantasy) producers. Stranger things have happened, though. Williams didn't run the 40 or participate in any of the agility drills in Indianapolis, opting instead to wait for Clemson's pro day to show off his athleticism. However, Williams didn't exactly wow anyone with his work in the bench press, vertical and broad jumps. The big receiver's game tape will prevent any real worry about his draft stock. He remains in the upper echelon of this receiver class with John Ross and Corey Davis. He'll also be a name that fantasy owners will want to pay attention to. This week was a disappointment, but not a catastrophe. Jones announced his presence to the scouting world with a couple of circus catches at the Senior Bowl. While they didn't count within the flow of the game, they were attention-grabbers nonetheless. There were still questions about Jones' video game numbers during his final season at East Carolina because so much of his production came on screens and slants. Could he be a field stretcher with the ability to play on the outside? Those fears were calmed when Jones ran a 4.45 40. He's not likely to be more than a third round or later selection with only very deep sleeper fantasy appeal for now. Stay tuned for further developments. Samuel spent his career at Ohio State listed as a running back, though in 2016 he pulled double-duty with 97 rushing attempts and 74 receptions. Now that he's making the switch to becoming primarily a receiver, he's been something of an enigma to evaluate. It also made it of paramount importance for Samuel to have a good combine. Running the 40 in 4.31 seconds definitely helps with that. Landing in the top one-third of combine receiver SPARQ rankings also helps quite a bit. Samuel will still be hard for fantasy owners to figure out, but his athleticism and proven ability as a playmaker suggests he could be a valuable option before the 2017 season ends. While Deshaun Watson was wowing scouts at the combine, his Clemson teammate wasn't earning quite the same reaction. Gallman put up a nice number on the bench press, but his athletic testing didn't go nearly as well. His times in the 40, the 3-cone, and the 20-yard shuttle underwhelmed which will bring into question both his long speed and his short-area quickness. Unless Gallman explodes at Clemson's pro day, he appears ticketed for a reserve role in the NFL and likely won't have much of a fantasy future. 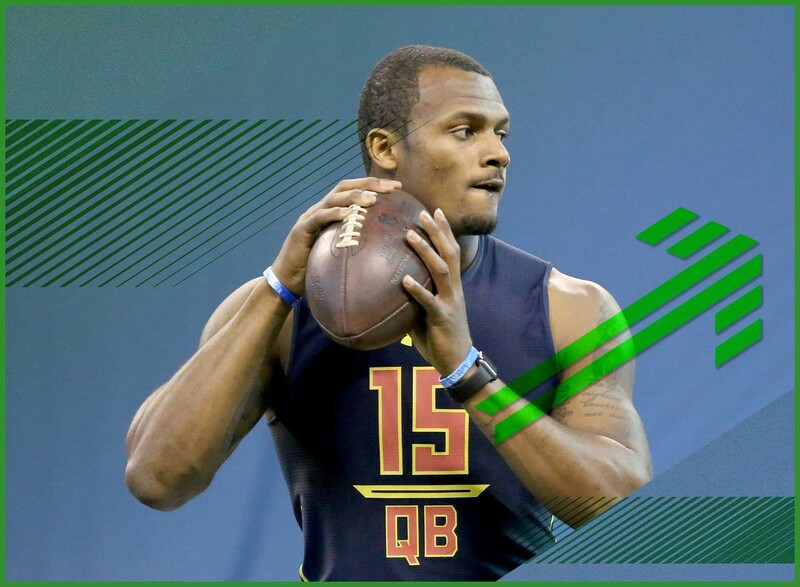 If you think there's confusion among the top tier of this year's quarterback draft class, try sifting through the rest of the group. Kaaya didn't exactly make himself stand out in Indy by skipping the athletic drills and reviews were mixed during his throwing session. He's likely to hear his name called sometime on Day 3 of the draft, but Kaaya has a long road to being a starting NFL quarterback. Did I mention that this year's tight end class is deep? With so many talking about O.J. Howard and David Njoku battling to be the top player at the position, Engram threw his hat into the ring with freakish athleticism. Scouts will have questions about his play strength and abilities as a blocker. But in the current NFL where teams are seeking matchup-defying tight ends, Engram has a chance to be an impact offensive player early in his career. Webb is sitting just outside the consensus top tier of quarterbacks and looking to make a strong impression. He seems to have done that with his athletic testing and his throwing session. While it puts some concerns to rest (his 40 time was an eye-opener), scouts will still wonder about Webb's overall accuracy and ability to read defenses. After watching Jared Goff come from the same offense and struggle enormously in his rookie season, some teams -- and fantasy managers -- will understandably be a little wary of Webb. Liufau entered the combine as a fringe QB prospect needing a big peformance to put himself in the conversation for the draft. Instead his workout only reinforced many of the same weaknesses that scouts saw on tape. At this point, there's a good chance that Liufau might go undrafted and shouldn't be on any fantasy radars heading into the summer.